Happy World Breastfeeding Week friends! I found these beautiful images of breastfeeding on Pinterest that I just had to share. I’ve had the most special moments nursing River and Oak. In the quiet, when it’s just my baby and I, and all that matters is that moment… it’s wonderful. I am still amazed at what our bodies can do! Have a fantastic weekend. And if you’re new here from A Beautiful Mess, Welcome! I love the outfit post you did a few posts down, babywearing. You are gorgeous! I enjoyed your home on ABM and checked in over here 🙂 I admire the ethic of your company, too! I think the woman in the second picture may be the former wife of leader of the Source cult that was quite popular into the mid 70s in southern California. There's a great documentary about it on Netflix. Thank you Cait! 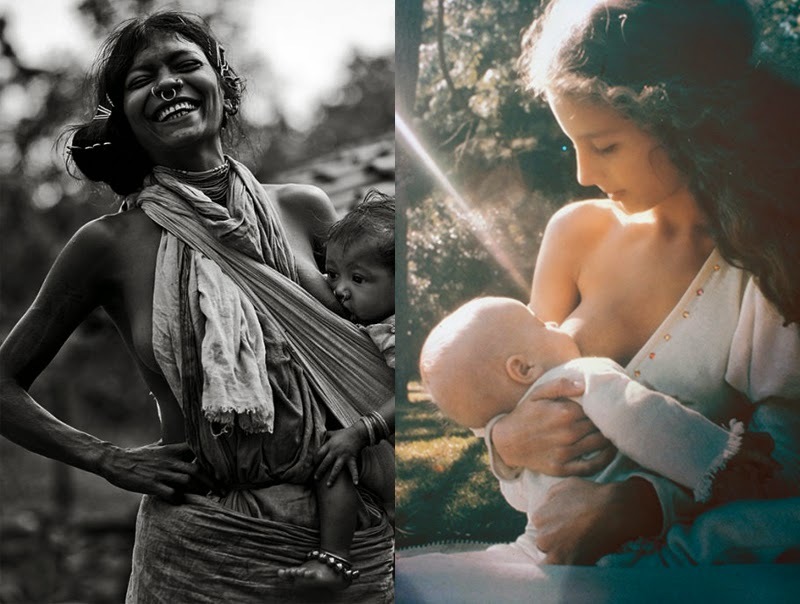 I find that I'm more drawn to the peaceful breast feeding photos lately. That's Awesome, I'll check it out for sure. Thanks for the heads up! So lovely to see breast feeding on your blog! It's been 10 years since my last child weaned, but just seeing the images you've posted brings back such fond memories! Both my kids nursed until 3 and 4 and not only are those are some of my most cherished moments, but I see it as gift of life that will carry our kids through all their illnesses and emotional ups and downs for the rest of their lives.